The seventh doll in the very popular Sailor Moon x Pullip collaboration line has been announced via Groove’s blog and the official Sailor Moon site, it’s Tuxedo Mask! Not a whole lot of details about the release of Tuxedo Mask have been announced at this time, just his release date which is set for March of 2015 (April for those of us in the US) as well as his price 18000 yen (approximately $151 USD at this time). Tuxedo Mask is the first non-Pullip doll released in the line, I wonder if we will see more non-Pullip characters released in the future? Personally, I’m still hoping for a Dal Chibi Moon to be released eventually. It is not known at this time if there will be an exclusive bonus item for those preordering from Bandai’s official store though I assume there probably will be (maybe a rose?). 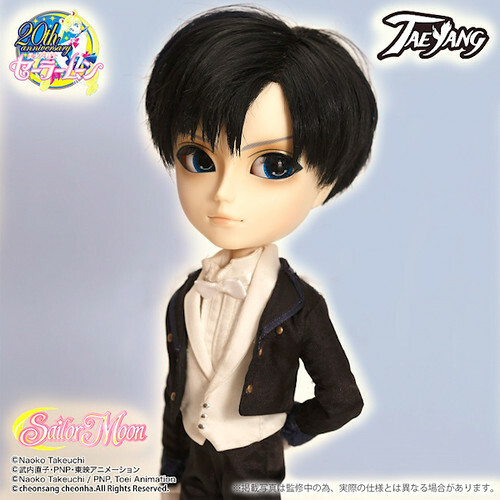 Groove has very faithfully translated Tuxedo Mask’s character design into doll form. Tuxedo Mask was always quick to rush in and save the day whenever Sailor Moon was in trouble and he definitely looks the part of a dashing hero! His stock looks to be of nice quality and is very detailed… and there does not seem to be even the tiniest bit of pleather in it. 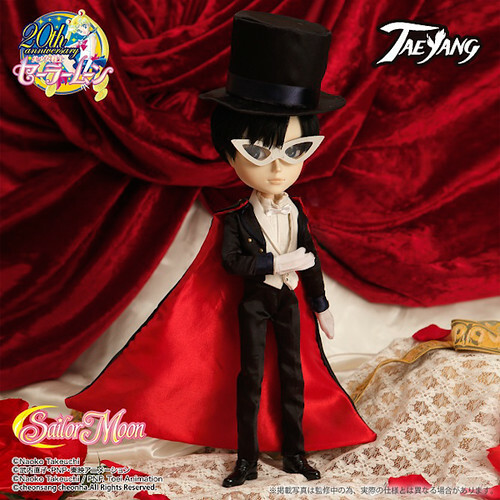 Considering how few Taeyangs were released last year, I do find it a bit funny that Tuxedo Mask is announced so quickly on the heels of the new version of Taeyang Sebastian both boys are anime collaborations, have dark hair, wear suits and even come with top hats! He does have a nice face up! The only thing I am not really that fond of is the eyebrows, the shape is nice but the color doesn’t seem quite right they almost look dark blue. I love his blue eyes! This entry was posted in Announced, Doll, Taeyang/ Namu and tagged 2015 pullip, bishoujo senshi sailor moon, sailor moon, sailor moon x pullip, taeyang, tuxedo mask. Bookmark the permalink.